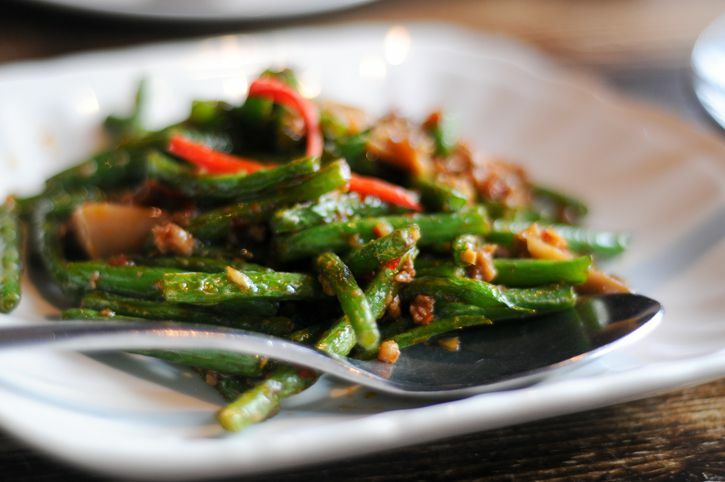 Szechuan green beans are also known as Sichuan dry-fried green beans (干煸四季豆, Gan Bian Si Ji Dou). This dish is very popular in both the West and East and the interesting thing is the majority of English recipes like to make a “vegetarian” version of this dish but if you search for this dish in Chinese, 99% of the recipes contain pork mince. In this article I decided to include the former Chinese food expert’s recipe but also my version of this delicious, simple and quick dish. The authentic way to eat this dish is with mince and beans which makes this a perfect weeknight dinner recipe. All you need to do is cook this dish, serve with some hot rice and you have a dish that’s delicious, cheap and full of nutrition. Perfect or a working mum like me. I like to use both fresh and dried chilli to cook this dish but you don’t have to use two different kinds of chilli. The reason I use two kinds of chili is I like the combination of spicy flavours and personally I like my food really quite spicy but if you don’t, you can use less chilli or just leave them out entirely. As with a lot of Eastern cooking you don’t have to stick to the recipes but this dish does taste better with. Another interesting ingredient I used in my recipe is “Tianjin preserved vegetable”. This preserved vegetable consists of finely chopped Tianjian cabbage. It tastes quite salty so it’s better to add this in your dish first then check the seasoning afterward. But this ingredient is also optional. Make sure you wash and drain the green beans ahead of cooking so you can get rid of as much water as you can. You need to rid of the water so that when you deep-fry the dish you won’t have too much oil splash or even oil pops. Please check the article “Deep-fried Cooking Techniques in Chinese Cooking” before you start if you’re not familiar with how to deep-fry. 1 tablespoon dried shrimp, softened in cold water and drain. Then finely chop. Wash and drain the green beans and make sure you get rid of as much water as you can. Marinade the pork mince with all the ingredient on the list and leave to marinade for 15 minutes. Heat up 3 cups of oil in a wok and deep-fry the green beans until they look wrinkly and dry. This will take about 5-7 minutes. Take out the green beans and drain the oil. You can use a colander or place on a few sheets of paper towel to drain the oil. Leave aside. Remove the oil from the wok but leave approximately 1 tablespoon of oil in the wok. Heat up the wok again and stir-fry the chili, ginger and garlic first until the aroma comes out. Add dried shrimps and preserved vegetable into step 4 and stir-fry for 10 seconds. Add green beans into step 6 and stir-fry for further 30 seconds. Check the flavour and add seasonings if necessary. Serve with some cooked rice and serve hot. Wash the long beans, drain thoroughly, and trim the tops and bottoms. Cut the long beans on the diagonal into slices approximately 2 inches long. Chop the garlic, ginger and white part of the scallions. Heat 1 tablespoon oil over medium heat. Add the long beans and stir-fry until they start to shrivel or “pucker” and turn brown (5-7 minutes). Remove the long beans and drain in a colander or on paper towels. Heat 1 tablespoon oil in the wok on high heat. Add the garlic, ginger and scallions. Stir-fry for a few seconds, then add the chili paste and stir-fry for a few more seconds until aromatic. Add the long beans and the remaining ingredients. Mix together and serve.